Approximately 80% of Americans will suffer from lower back pain. We can Help. 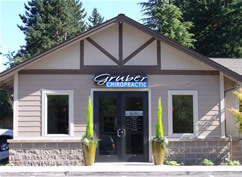 Welcome to the website of Gruber Chiropractic, the practice of Bruce Gruber DC, your Gig Harbor Chiropractor . If you’re in the Gig Harbor area and are seeking gentle chiropractic treatment, you’ve come to the right place. Dr. Gruber’s philosophy of care is to develop a customized treatment program for every patient. He likes to empower you with choices in your care. On your first visit to our comfortable, relaxed office, he’ll talk with you about any physical problems you may have, do an exam, then give you a report of findings and discuss his recommended personalized strategy for treatment. If Dr. Gruber thinks it’s a chiropractic problem, he’ll give you treatment options. If he doesn’t think chiropractic is the best solution to your problem, he may refer you to another physician or a physical therapist. Gruber Chiropractic often gets patient referrals from physicians and physical therapists. At Gruber Chiropractic, we like to think of the entire body as a complex of interrelated systems. With that in mind, we encourage you to exercise and eat healthy along with your chiropractic care. Your total wellness is important to us. Think of Dr. Gruber as your Health Coach. Have a question for Dr. Gruber?